in EUR, EUR to ZAR, ZAR. The Euro to South African Rand (EUR/ZAR) tumbled to its worst levels in around two weeks when markets opened on Monday, amid fresh speculation that controversial South African President Jacob Zuma may not last much longer in his role. Over the weekend, the African National Congress (ANC) reportedly began talks to replace Zuma with the ANC’s new leader, Cyril Ramaphosa, as Ramaphosa continued to take steps towards stamping out corruption in the nation. Demand for the South African Rand (ZAR) jumped again on Monday on hopes that Zuma, who is unpopular with investors, could be pushed out of office sooner than expected. Originally, markets predicted Zuma would remain in office until his term formally ended in 2019. Ramaphosa’s pledges to tackle corruption in South African politics have made him popular in markets and rising confidence that his agenda will go ahead has made the Rand appealing. Speculation has risen that Zuma could be pressured to resign within just a few weeks, with analyst Susan Booysen from University of Witwatersrand’s School of Governance predicting Zuma only had ‘between 10 and 30 days maximum’. The Euro (EUR) has been unable to hold its ground against a stronger Rand over the past week, as investor hopes for the European Central Bank (ECB) to take a more hawkish tone in the coming months have faded. Following hints in December’s ECB meeting minutes that forward guidance would evolve in early 2018, the Euro saw a surge in demand. However, ECB officials have since indicated that the shared currency’s surge in strength was an obstacle for the bank and that it had not been justified by any recent economic news. As a result, investors sold the recently strong Euro from its highs and are likely to remain hesitant to buy the shared currency until Thursday’s highly anticipated European Central Bank policy decision. EUR/ZAR could have fallen further on Monday if Euro investors didn’t have some good news to react to. While not the decisive decision some investors had hoped for, Germany’s SPD Party voted over the weekend to agree to coalition talks with German Chancellor Merkel’s CDU Party. The vote marked a significant step towards ending a deadlock in coalition talks, which has left Germany without a government since the election last year. It boosted hopes that Germany would soon be led by another ‘grand coalition’ of the CDU and SPD, as with the previous government. However, the close vote of 362-279 indicated that Merkel’s influence in German politics may be dwindling, so the news only gave the Euro limited support. 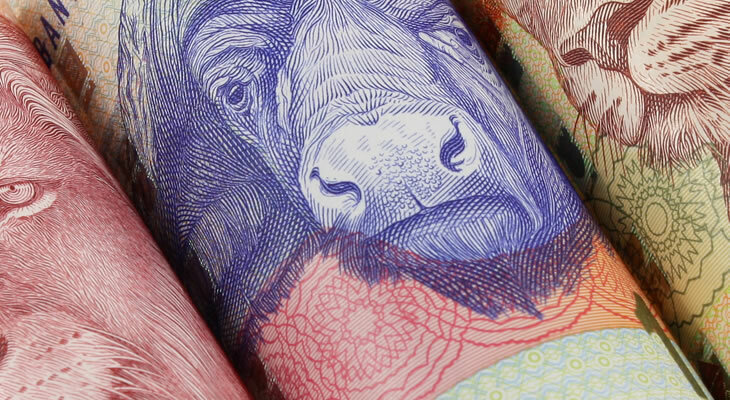 The Euro to South African Rand (EUR/ZAR) exchange rate is unlikely to recover its recent losses in the coming sessions, unless the Rand outlook suddenly changes. For example if Rand investors are suddenly given more reason to expect that SA President Zuma will remain in office until 2019 after all, EUR/ZAR could recover some of its recent losses. Otherwise though, the pair is likely to continue falling – at least until Thursday when the European Central Bank’s (ECB) will hold its January monetary policy decision. The bank is expected to leave monetary policy frozen, and following last week’s cautious comments from ECB officials it is not expected to significantly change the language used in forward guidance yet either. If the bank’s tone is similar to the one seen in December or more cautious in some way, the Euro could continue to weaken until the end of the week. However, if the bank does show hints of more hawkishness, EUR/ZAR could advance. Upcoming economic data, including Eurozone confidence data from ZEW, Eurozone PMIs from Markit and South Africa’s December inflation report could influence the Euro to Rand exchange rate too, but ultimately central bank and political news will remain the focus.